Handmade Botanical Perfumes By Artisan Absinthe Dragonfly Experience the Magic and Luxury of Botanical Perfumes! Esscentual Alchemy's botanical perfumes are handmade from scratch by me in small batches, using materials that I either hand-tincture or hand-distill. If I can't do it myself, I buy from other small business owners who do the same. 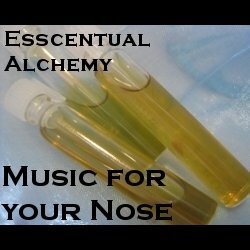 When you purchase any of Esscentual Alchemy's botanical perfumes, you are helping to support a small, home-based, female owned and operated business. Thank you for supporting my business. The Pictures help me convey what I had in mind when I created the perfume, since no one has invented Smell-O-Vision monitors yet!